While the word refers to rubbish, I think it could also apply to a knitter's valued yarn stash that has a way of building up - yarn that was purchased with every good intention of making something wonderful within the next few weeks, but then ends up languishing in the stash for months, even years. 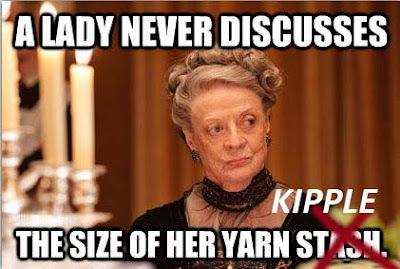 If you're looking for me....I'll be busy shopping my yarn stash kipple. So far I understood Kipple-ization as a reference to the law of enthropy regarding order/disorder-chaos.